Graeme McDowell insists that it’s “only a matter of time” before Rory McIlroy overcomes internal and external pressures and conquers his new equipment. As he prepares to return to action in next week’s Northern Trust Open and regain his place in the world’s top 10 this year, McDowell appeared on the Golf Channel’s revamped Morning Drive programme and gave his views on his stablemate’s teething problems with his Nike clubs and that embarrassing missed cut in Abu Dhabi last month. “There has been a lot of criticism thrown Rory’s way,” McDowell told presenter Gary Williams. “Bad move, etcetera, etcetera. I believe there are a lot of great golf companies in the world right now making great golf equipment. When you are as talented as Rory, I don’t care what your driver says, or your irons say or your golf ball says, when you are as good as he is, it is a transition that should be fairly straightforward for him to make. Ranked 19th in the world, McDowell hasn’t played since he won Tiger Woods’ World Challenge in December for his first victory since he changed to Srixon club following a stellar 2010 campaign that brought him multiple wins, including the US Open and the glory of winning the Ryder Cup for Europe at Celtic Manor. “Since January I’ve definitely had the itch to play,” said McDowell, who will behind his season by playing Los Angeles, the Accenture Match Play, the Honda Classic and the WGC-Cadillac Championship in Miami. Liek the Nike mural, McIlroy’s equipment change is going to take time. 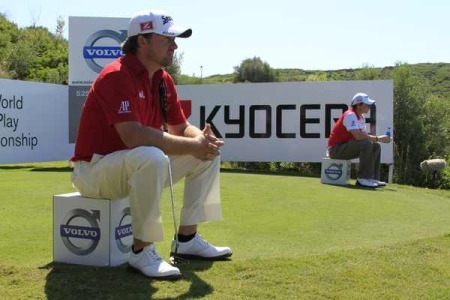 Via @nikegolfWith the PGA Tour switching to a wraparound season this year, McDowell admitted that he’s already thinking about what events he’ll play in 2014 and explained the difficulty of supporting both the European and the US PGA Tour. “I am ready looking at my January-February schedule for 2014,” he said. “I guess playing on both the PGA and European Tours I am in a nice scenario in that I get to cherry pick the best events in the world. It is a lot of fun to be a global player. Being in the top 20 in the world gives me the options to play everywhere. “My goal is world ranking based in the next couple of years and I really want to get myself back into the top 10 and top 5 in the world gain. I will play 16 or 17 on the PGA Tour this year and another 13 or 14 on the European Tour. With the overlaps with the WGCs that equates to 26-27 events. The exodus of European players to the PGA Tour speaks volumes about the difficulties facing the European Tour and the struggles that Ryder Cup captain Paul McGinley will have in convincing George O’Grady and his board that he should have three or four picks for Gleneagles in 2014. Getting the big names to support the traditionally strong events in Britain, Ireland and continental Europe is a major headache in a shrinking European economy. When there is so much money on offer in the US and Europe’s co-sanction tournaments in Asia, particularly China and the Middle East, getting the Ryder Cup stars to play in Europe is becoming mission impossible. Graeme McDowell gives his views on Morning Drive.“The European Tour has never been as strong a product as it is right now with the players it has - Rory No 1 in the world and winning majors. Guys like Luke Donald, Martin Kaymer Lee Westwood - all No 1 in the world the last few years. Quality, quality players. The quality of our product has never been stronger, but yes, Europe is in a deep financial depression and great sponsors are hard to find. McDowell tried hard to sound positive about the European Tour but admitted that he’d continue to cherry pick the best events. Europe’s problem is that there is no money for sponsors or great events and G-Mac all but admitted that the US had won the war a long time ago. As for his forthcoming wedding to fiancée Kristin Stape in September, McDowell said: “Certainly a new chapter in my life and one I am very proud of and very excited about. I feel like it has brought a new level of comfort to my life with regards stability off the golf course. Graeme McDowell revealed some big news at the Honda Classic on Friday — his wife Kristin is expecting their first child, a girl. The baby is due to arrive during the FedEx Cup play-offs, a month before the Ryder Cup at Gleneagles, at the end of August.Graeme McDowell revealed some big news at the Honda Classic on Friday — his wife Kristin is expecting their first child, a girl. The baby is due to arrive during the FedEx Cup play-offs, a month before the Ryder Cup at Gleneagles, at the end of August.